With Week 2 behind us, and some more fresh stats to analyze, I’m here to help you with your toughest fantasy football start/sit decisions for Week 3. Even with Joe Mixon playing on 50 percent of the team’s snaps last week, Bernard still saw six carries and seven targets. Last season, Mixon played on just six snaps from Weeks 14 through 16. In those three games, Bernard averaged 16.0 carries per game, 5.7 targets per game, and 20.7 fantasy points per game, while playing on 86 percent of the team’s snaps. Fitzpatrick has 72.3 fantasy points in his first two games … otherwise known as the most by a quarterback ever through their team’s first two games. He’s also our highest-graded quarterback ever through the first two weeks of the season. He’s a high-end QB1 until proven otherwise. Dalvin Cook missed practice on Wednesday. If he is out, Murray should be started, even in very shallow leagues. Murray averaged 18.5 touches per game over his final 10 games last season, while working in a committee alongside Jerick McKinnon. That’s his absolute floor this week, while his ceiling reaches much higher in a dream matchup. The Bills surrendered the most fantasy points per game to opposing running backs last year (28.4), and well, would you look at that, they’ve surrendered the second-most (38.5) this season as well. At home, favored by 16.5 points, he could be one of the top scorers of the week. As outlined here, Smith-Schuster’s volume and production were tremendous last week, despite running 71 percent of his routes against Kendall Fuller – our highest-graded slot cornerback from a season ago. This week his matchup looks much better, with Antonio Brown still banged up, up against a Tampa Bay secondary that ranked as our second-worst and recently sent starting slot CB Vernon Hargreaves to IR. With Hargreaves out, Philadelphia slot receiver Nelson Agholor scored 22.8 fantasy points on 12 targets against the Buccaneers last week. Smith-Schuster a fantasy WR1 this week. As outlined here, there hasn’t been much separating Detroit’s three wide receivers in terms of usage but all three rank top-20 in expected fantasy points per game. Tate ranks highest (17.9), however, at 12th overall. Tate also draws the best matchup this week, in shadow coverage against New England slot cornerback Jonathan Jones. In 38 career games, Jones has played on over 50 percent of his team’s snaps just seven times. New England gave up 22.2 fantasy points to wide receivers in the slot last week, after allowing the most among all 32 teams in 2017. Although the matchup looks soft for all three Washington wideouts, I’d avoid starting any of them this week (in shallow leagues). Among all 46 wide receivers to run at least 65 routes thus far, Crowder ranks 46th (9.0 percent), Doctson 45th (9.4 percent), and Richardson 36th (13.6 percent) in targets per route. Given the lack of volume and the parity between all three, each is too risky to start this week. The Rams defense ranks sixth-best in pressures generated per dropback while the Chargers offense ranks sixth-worst in pressures allowed per dropback. The Rams sport three starting cornerbacks who all graded out top-20 a season ago. Through two weeks they’ve surrendered just 196.5 yards per game to opposing quarterbacks, with a 0:4 touchdown to interception ratio. They might just be the best defense in the NFL. With DeVante Parker out the last two weeks, Stills should have seen more volume than the 4.0 targets per game he’s averaging. However, he didn’t – and now Parker is practicing in full. He’s an easy fade until this changes. Unlike Stills, Davis has seen terrific volume over the past two weeks, with the team’s previous leading pass-catcher (Delanie Walker) placed on IR. However, QB Marcus Mariota is likely out again this week, or at least will be playing well below 100 percent. Add in a matchup against the Jacksonville Jaguars – who ranked best in fantasy points per game allowed to wide receivers last year – and Davis feels safe to leave on your bench this week. Breida is currently the NFL’s leading rusher (184 rushing yards) but he’s played on just 42 percent of the team’s snaps while drawing only 48 percent of the team’s running back touches. Alfred Morris has received four of the team’s opportunities inside the 10-yard line while Breida has only received one. I’m proceeding with caution until the volume tips more towards Breida’s favor. In five games with Deshaun Watson, Fuller averages 21.8 fantasy points per game with outputs of 19.9, 20.2, 14.2, 29.5, and 25.3. In what’s likely a neutral or above average matchup at worst, Fuller should be started as a mid-range WR2 this week. Thompson has led the Redskins in targets in each of the past two weeks and totals nine targets more (20 total) than the next-closest receiver on the team. In Week 1 – a game with disadvantageous gamescript (to Thompson), he still totaled five carries and seven targets. Since the start of last season, Thompson totals 6.1 carries per game, 6.3 targets per game, and 16.9 fantasy points per game. For perspective, that would have ranked ninth-best last season. This week, a game with beneficial gamescript (to Thompson at least), as 3.0-point underdogs, Thompson is a safe start as a high-end RB2. Cooper’s Week 1 was understandably underwhelming against the best cornerback trio in the league. Though, it was encouraging to note he ran 45 percent of his routes from the slot that week (here’s why). That number came down in Week 2 but that’s a good thing when you’re facing off against Chris Harris Jr.’s Denver Broncos. Head coach Jon Gruden promised more work for Cooper in Week 2, and delivered, with Cooper totaling 10 catches and 116 yards on 10 targets. He gets a softer draw this week against the Dolphins, who currently rank third-worst in team pass coverage grade. There’s a lot to stack against Wentz in his first game back – mobility is likely to be diminished following the ACL injury, he’s without Alshon Jeffery, and he might be rusty. Still, there’s more positives than negatives by my count. He’s been practicing for over a month and has looked great by all accounts. Indianapolis ranks eighth-worst in pressures per dropback and were our worst secondary heading into the season. Jay Ajayi is likely to be out this week, which may dictate a more pass-heavy approach using Corey Clement as an extension of the passing game. In any case, he ranked third-best in in fantasy points per game (25.1) last year and that’s a far distance to fall to “not-startable.” He’s a low-end QB1 this week. Through two weeks, Robinson ranks ninth among wide receivers in both targets (nine) and target market share (30 percent). Arizona’s CB Patrick Peterson no longer shadows WR1s, which means Robinson projects to face Jamar Taylor and Budda Baker on at least two-thirds of his routes. Taylor and Baker both rank bottom-12 of 79 qualifying cornerbacks in yards allowed per snap in coverage. He’s a low-end WR2 this week. 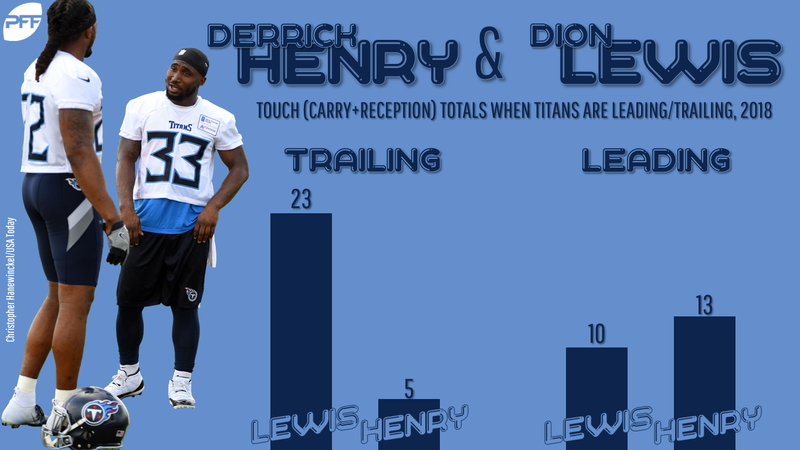 With Jacksonville at home favored by 4.5 points against Tennessee, and with Tennessee’s starting quarterback questionable, this seems like a game far better suited for Dion Lewis than Henry. Tennessee has trailed on 44 percent of their plays thus far, and projects to trail again this week. When trailing, Lewis totals 15 carries and eight targets to Henry’s five carries and zero targets. Even when leading (36 percent of the time), Henry totals only three more touches than Lewis (13 to 10). In PPR leagues, Henry is only a low-end RB4 this week. Like with Henry, projected gamescript (underdogs by 3.0 points) should be working against Peterson this week. We saw last week what happens when that’s the case – Peterson saw only 11 carries (for just 20 yards) and three targets in a 21-9 loss to the Colts. He’s not an outright fade like Henry, but he’s worth bumping down to the high-end RB3-range in PPR leagues. Through two weeks, Anderson totals only six targets – 14 less than Quincy Enunwa and five fewer than Terrelle Pryor. That alone is enough reason for me to leave him on my bench this week. Ebron looks like a solid fantasy option after scoring touchdowns in back-to-back games but his fantasy production has been well above his volume. He scored on two of his three end-zone targets but ranks third on the team in expected touchdowns. He’s averaging just 4.5 targets per game and 38.5 yards per game. He’s a touchdown-or-bust mid-range TE2 this week. The Bills have an implied point total of just 12.25 (lowest by 3.75) and are 16.5-point underdogs to a Minnesota Vikings defense that ranks best in fantasy points per game allowed to running backs since the start of last season. The negative gamescript might not matter too much for McCoy if he were seeing heavy target volume, but he’s not (just seven total across two blowouts). He’s also now dealing with cracked rib cartilage.” He’s a mid-range RB3 in PPR leagues this week. Njoku has disappointed in back-to-back games but has seen good volume, averaging 6.5 targets per game (fifth-best at the position). I like his chances of posting a big game this week, with Josh Gordon now on the Patriots and Jarvis Landry banged up and listed as questionable on a short week. If Leonard Fournette is out this week, I like Bortles as a high-end QB2. Over the past two seasons, Bortles averages 22.5 fantasy points per game with Fournette out of the lineup and 14.7 in games he’s been active. He averages 112.4 more passing yards per game and 3.0 more red zone attempts per game. This week he’s playing at home against the Tennessee Titans who allowed the 12th-most fantasy points per game to quarterbacks last year. The only change they’ve made to their secondary has been adding CB Malcolm Butler who currently leads all cornerbacks in yards (257) and touchdowns (three) allowed. Riddick has seen tremendous volume in back-to-back losses, totaling four carries and 19 targets. Though production was poor, I like his upside this week, as 6.5-point underdogs against the Patriots. Since the start of the 2017 season, New England has allowed the second-most receiving fantasy points per game to opposing running backs (11.7). If Jay Ajayi and Darren Sproles are out, Clement slides up my PPR rankings and becomes a high-end RB3. In a worst-case scenario, head coach Doug Pederson continues to use his running backs in a committee and Wendell Smallwood assumes the Ajayi role, while Clement still receives the lion’s share of the targets. Clement and Sproles combined for 10 carries and seven targets in Week 1 and Clement handled six carries and six targets in Week 2. Through two weeks, Kansas City is our worst-graded team in pass coverage, while ranking second in plays surrendered, fourth in points allowed, and sixth in yards allowed. This week, Garoppolo should get back WR Marquise Goodwin who accounted for 25 percent of his total yards in 2017. After an underwhelming start to his 2018 season, I’m expecting a bounceback game this week. Phillip Lindsay is out-snapping Freeman 56 to 46, out-carrying him 29 to 23, and has seen more work in the passing game (four targets to one). Worst yet, Lindsay has been far more productive, totaling 213 yards and 30.3 fantasy points to Freeman’s 99 and 15.9. Our grades bear this out as well, with Lindsay ranking 17th to Freeman’s 31st. On the road against a stout Ravens run defense, Freeman is just a fantasy RB4 this week. Eifert ranks 22nd among tight ends in routes run (46) and 23rd in targets (seven), and that’s about where I have him ranked this week, meaning he isn’t in play. James scored 24.8 fantasy points in Week 2. 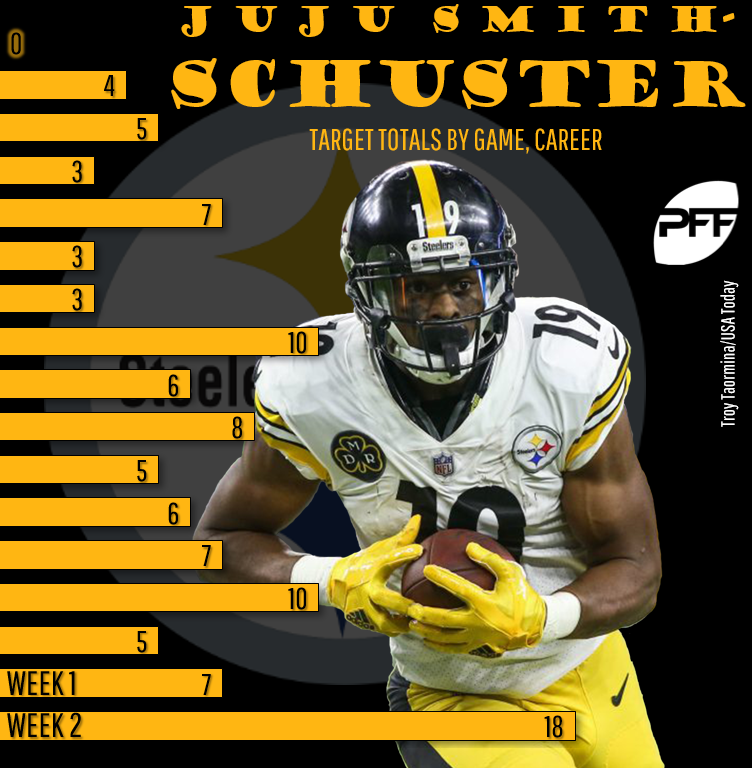 He likely benefited from an injury to Antonio Brown, Ben Roethlisberger attempting a whopping 60 passes, and TE Vance McDonald being eased back into playing time following a long injury, but still, volume wasn’t tremendous (five targets). I’m chalking this up to a fluke and leaving him on the waiver wire in my own leagues. After seeing terrific volume but very little production in Week 1, the volume disappeared in Week 2 with Josh Allen targeting him on just three of 33 attempts. Efficiency and scoring potential likely won’t be good at any point this year, playing on what might be the worst offense in the NFL. Against the Vikings, projected to be shadowed by CB Xavier Rhodes, he’s a no-brainer “sit” this week. Last week, all three running backs saw between 18 and 23 snaps and five and 12 touches. Due to the low and uncertain volume among all three, none are in play for me this week.